Technically I suppose I should be celebrating that tomorrow…when they have been delivered. But I finally took the step of phoning the mobile phone company and agreeing to a new contract with free phones. Only the one A wanted isn’t free. But it’s still a lot cheaper than if we actually buy it. Somehow though, we have talked ourselves round from ‘we won’t get a new contract, we’ll convert to pay as you talk’ to ‘want new phones, let’s get a contract’. That said, it is a much cheaper contract. Unfortunately, that means I have to stay in all day tomorrow to sign for them. I had planned to go out for lunch with lovely Kat, but I guess I’ll have to phone her and apologise…unless the delivery comes early enough. What have I been doing this weekend? Well, Saturday was kind of drowned out by A going out for Alan’s stag do. He worked until lunchtime, slept all afternoon, then went out from 6pm to 5am!! I don’t begrudge him going out, but it always worries me a little when he gets home that late…and when the afternoon was completely taken up in sleeping so he was awake enough to go out. I did have a whiny, clingy hour or so. I knew I was doing it, and being unreasonable with it, but I just couldn’t help it. Then, when A had gone, I had a very low, depressed hour when I felt so lonely. Eventually I remembered that these damn pills make me anxious and depressed, and I felt better. Weird. I could do without the roller coaster, thanks! These are the socks I knitted for myself…they are called clover. The picture doesn’t show it very well but they include both lace and cabling and are very pretty. Also, I love the random striping effect. They are really soft and comfortable. 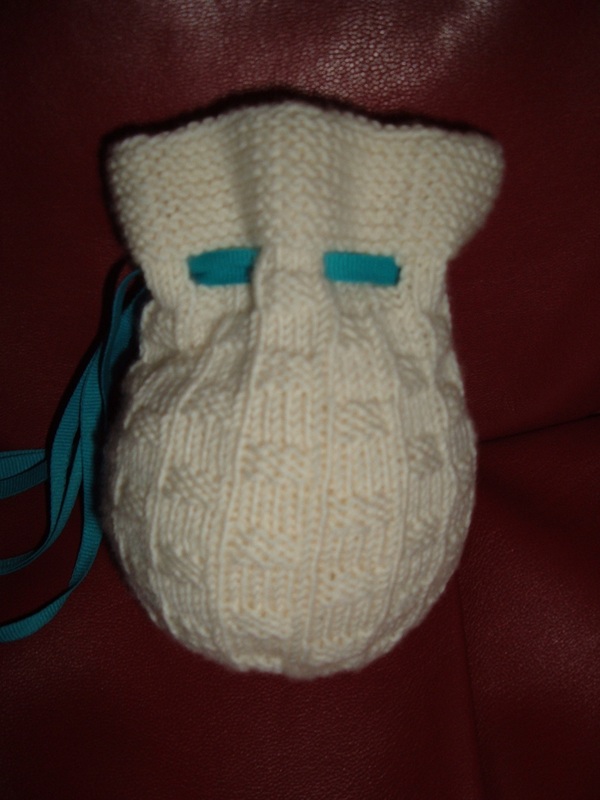 Here is the little evening bag I have created for Alan and Kat’s wedding. It’s only just big enough for a phone, small purse and a car key. The ribbon is an old hair ribbon…and I have a bunch of them in different colours, so the bag handle can be co-ordinated with my outfit. 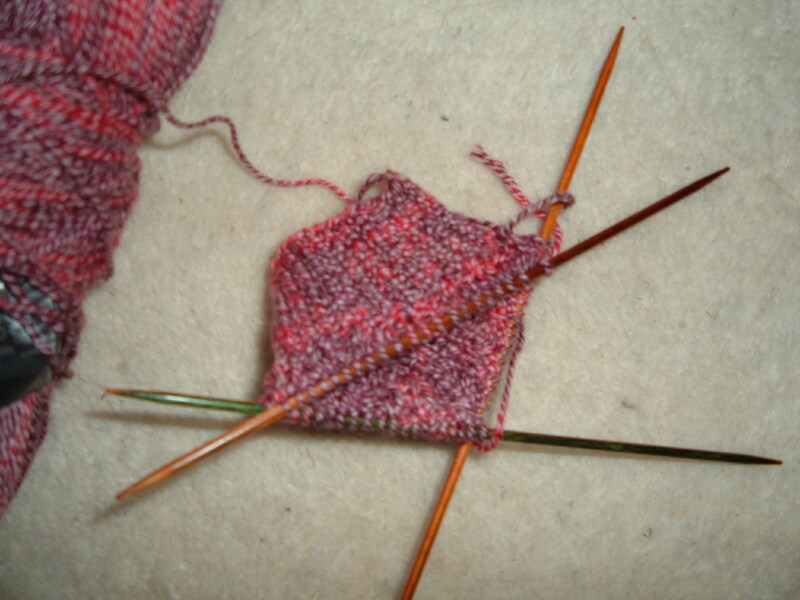 This is the start of a sock called froot loop, for A. This is going to be a net curtain for the dining room…umm, maybe. If it works out. So, this week? New phones tomorrow, and maybe lunch with Kat. Apart from that, who knows. I have challenged myself to get out at least once, alone. I might just get a bus to big Asda, browse around the library over there, look in Borders, get the bus home again. I might be braver than that and get the train to Reading. Who knows? 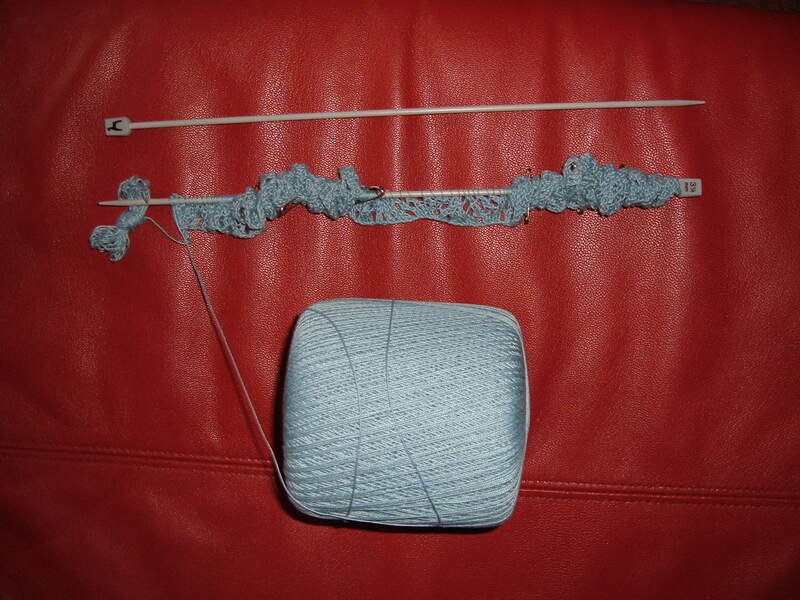 This entry was posted on August 11, 2008 at 5:53 pm and is filed under Health, knitting. You can follow any responses to this entry through the RSS 2.0 feed. You can leave a response, or trackback from your own site.